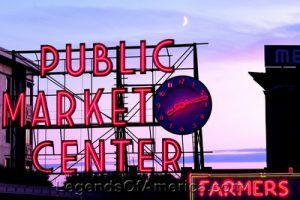 The Pike Place Market in Seattle is not only a great place to shop but also the most haunted place in Seattle, if not all of Washington state. The Pike Place Market has a long history, having been created in 1907. It all began when rumors of price fixing began to circulate. 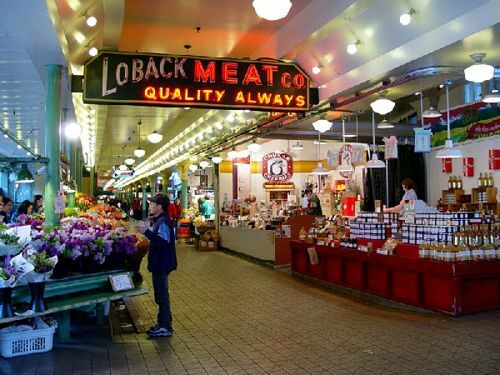 As a result, the Seattle City Council soon established a public market along the newly constructed four-block boardwalk known as Pike Place. 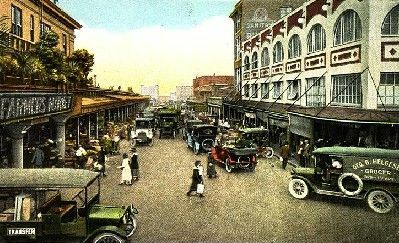 On opening day, August 17, 1907, residents were so eager for fairly priced fresh food that they swarmed over the first dozen farmers, emptying their cars within just a few minutes. Before long, a Pike Place landowner named Frank Goodwin, who had earned his wealth with Klondike gold, built the first marketplace building. His arcade opened on November 30, 1907. The Outlook Hotel and the Triangle Market were built the following year. 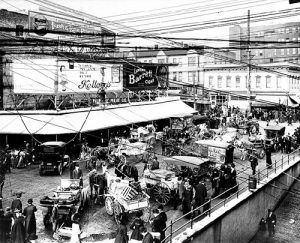 Growing demand led the city to extend the shelter in 1911 and hired the first “Market Master” whose job was to run the daily lottery for assigning stalls to competing farmers and vendors. In that first decade an number of multi-level buildings were constructed, most of which continue to make up the permanent arcades of the market today. The Great Depression had little impact on the market, as it offered the cheapest food in town. In fact, during this time, the market actually expanded. The market continued to thrive through World War II, and in 1941 the main arcades were purchased by an Italian farmer by the name of Joe Desimone. However, during the 1940’s and ‘50’s the market began to decline due to the increased numbers of motor vehicles and the advent of supermarkets in the suburbs. 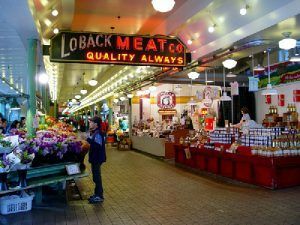 Pike Place Market, photo by Carol Highsmith. While the market continued to hold on, primarily supported by a community of arts and crafts people, by the 1960’s the maze of aging buildings was slated for demolition. However, a Seattle architect soon rallied a group and began the “Save the Market” campaign. 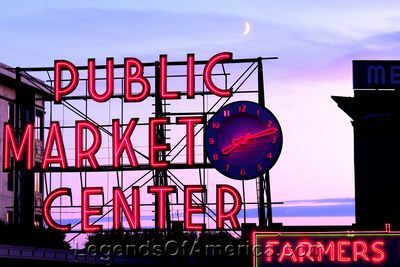 On November 2, 1971, voters approved a 17-acre historic district and the City of Seattle established a Public Development Authority to rehabilitate and manage the Market’s core buildings. Today, the historic Pike Place Market, overlooking Seattle’s waterfront, is one of the most visited attractions in the city. Here, you can find fresh foods of every kind, from a wide variety of colorful produce, to fresh fish and herbs. Numerous other vendors sell flowers by the dozens, beautiful arts and crafts, and Seattle souvenirs. Regarded by many as to be the seat of Seattle’s “soul,” the market displays items from some 600 vendors on a daily basis in one of the city’s most historic districts. Speaking of “soul,” or “souls,” I should say, the market is apparently home to more than just its many vendors and historic flavor, but is said to continue to host a number of restless spirits. One of the market’s most famous and popular visitors is Princess Angeline, the eldest daughter of Chief Seattle. Her Duwamish name was actually Kikisoblu, but the early settlers of Seattle dubbed her “princess” and so she was called during most of her lifetime. 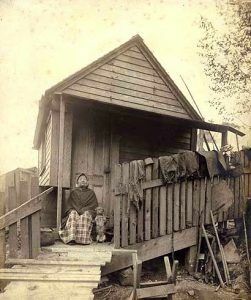 Though the 1855 Treaty of Point Elliott required that all Duwamish Indians were to leave their lands for reservations, Princess Angeline ignored the order and remained in the city. Living in a waterfront cabin on Western Avenue between Pike and Pine Streets, she was considered by many to be the link that connected the Native Americans of the area with the new settlers of the city. Angeline made her living taking in laundry and selling hand-woven baskets on the downtown streets of Seattle. Becoming a familiar figure, The bent and wrinkled old woman, most often seen with a red handkerchief over her head, a shawl around her shoulders, and walking slowly with the aid of a cane, became a familiar site along the waterfront.During this time a young photographer by the name of Edward Curtis became intrigued by her and often took pictures of her. At the age of 85 on May 31, 1896, Princess Angeline died and Seattle residents gave her a fine funeral and burial. The funeral was held at the Church of Our Lady of Good Help which was magnificently decorated and her casket was made in the form of canoe. Her body lays in rest at Lake View Cemetery on Capitol Hill. But Angeline was apparently not ready to leave as she has been spied at the Pike Market for decades. The market, built upon the site of her former cabin, is said to remain the home of her restless spirit. Over the years, many people have reported seeing her believing that she is a “real” person until she suddenly disappears right before their eyes. Just like the “real” Angeline, this spirit is said to move very slowly as if her feet barely touch the ground. Other have reported that the figure sometimes changes colors from a glowing white shade to lavender, blue and pink. Sometimes she has been spied with a young Indian boy. Allegedly, she is most often sighted near a rough wooden column in the center of the lower level. Several have reported that the column is seemingly surrounded by cold air and that photographs have displayed abnormalities. Others have seen her near the old Goodwill store. Though several exorcism attempts have been made by a Native American Shaman, Angeline continues to roam the market. The restless spirit of Arthur Goodwin, the nephew of original Pike Place Market developer, Frank Goodwin has also been spied at the market. Arthur was instrumental in helping Frank in the continued development of the market in its early days. From 1918 to 1941, Arthur held the job of Market Director and was often known to look down upon the happenings of the market from his upper-level office. Now called the Goodwin Library and utilized as a meeting room, Arthur’s silhouette is often seen looking down from the library. He has also been seen swinging a golf club in his old office. Another legend tells of a spirit, most often referred to as the “Fat Lady Barber,” who continues to lurk about the market at night. Evidently, in the 1950’s this fat barber was known to sing her customers to sleep with soft lullabies. After they were comfortably snoozing, she helped herself to any cash in their pockets. However, sometime later, before the renovations were made to the market in the 1970’s, an area in the floor gave way and she fell to her death. Today, maintenance workers report that they hear the sounds of lullabies when they are cleaning at night. Several shops within the market tell a variety of tales. At the Bead Emporium, a small boy is said to continue to dwell. When renovations were completed on the business a few years ago, a basket of beads was found in a wall that had not been accessed for many years before the store even opened. It is believed that he was hoarding the beads in the wall to play with. Other strange things happen at night such as the cash register drawer opening and closing of its own accord. This little spirit has also been known to visit the marionettes in the puppet shop. Sheila’s Magic Shop is also said to be haunted by the spirit of a woman who inhabits a crystal ball. Called Madame Nora, this restless spirit haunted a shop called Pharaoh’s Treasure before “landing” at Sheila’s. According to the tale, Pharaoh’s Treasure received the crystal ball from an old woman who wanted to trade it for a scarab. Though the old woman warned the shop owner that the spirit of Madame Nora was residing in the crystal ball, the owner thought little of it and made the trade. Almost immediately, unexplainable things began to happen, most notably numerous objects being moved during the night. Madame Nora is said to have been a woman who ran a place called the Temple of Destiny in the early days of the market. Known to have practiced crystal gazing, Egyptian sand divining, and Indian psychic projection, she evidently continues to leave her paranormal imprint today. Weary with the strange occurrences in Pharaoh’s Treasure, the crystal ball was passed on to the owner on to Sheila’s Magic Shop. At a Greek deli called Mr. D’s in the triangle building, the owner tells of spirits who are known to fight in a downstairs walk-in freezer. Some of his staff are so frightened of the dueling spirits, they refused to go in there. At the Shakespeare and Co. Bookstore the owners would arrive every morning to find the same book off the shelf and on the floor. Brushing it off each day, it was placed back on the shelf, only to find it on the floor again the next morning. Finally, the book was destroyed. Whether you’re looking to spy a ghost, shop or simply watch the myriad of interesting people, Pike Place Market is a “must see” while in Seattle.